As the two-wheeler sector continues to expand in India, researchers study the demographics of two-wheeler users and their possible role in promoting sustainable mobility. Photo by Meghana Kularni/Flickr. 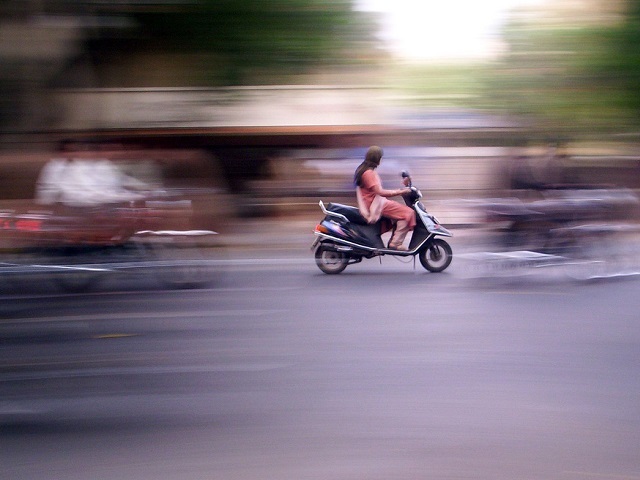 With increasing income levels and rapid urbanization, India’s motorized two-wheeler fleet – which includes mopeds, scooters, and motorcycles – continues to expand. As a private transport mode, two-wheelers are particularly popular because of their low costs, fuel economy, maneuverability, and ease of parking in congested conditions. While two-wheelers provide several benefits to travelers, they also create several challenges – including serious safety concerns and dependence on private motorized vehicles, which in turn has many negative impacts on society. As their numbers continue to grow in Indian cities, it is important to understand the role of motorized two-wheelers in urban transport, the profile of their users, and the mobility advantages and disadvantages they offer in order to create informed policy and planning to effectively manage the sector. Two-wheelers: A step towards the car? Since the 1970s, motorized two-wheeler growth in India has far outpaced car growth. Currently, two-wheelers make up 72% of the total registered vehicles, compared to cars, which make up 13%. As shown by the chart below, while car ownership may be on the rise, two-wheelers are leading the trend of mass motorization as millions of middle-class Indians can afford an entry level two-wheeler. Evidence suggests that increase in income levels would lead to car ownership, but not necessarily to a decline in the role or mode share of two-wheelers. The experience of Indian cities like Pune and other Asian cities like Taipei also suggest that rising income levels and car ownership do not necessarily lead to a decline in the role or mode share of two-wheelers. Chart depicting the growth of vehicles in India. Image via Wilbur Smith Associates, 2008. A recent EMBARQ India study of two-wheeler users in the city of Pune found that two-wheelers were the primary mode of transport for 55% of all household members (either as drivers or passengers) – particularly men and women between 18 and 50 years old. After age 50, the percentage of men and women two-wheeler drivers dropped drastically. Safety concerns, greater desire for comfort, and the improved purchasing power of an older adult are possible reasons for this shift. Safety with respect to two-wheelers is a significant concern. In Pune, 50% of the traffic accident fatalities in 2010 – 2011 were two-wheeler riders, only 1% of whom were wearing a helmet. To increase safety for those riding two-wheelers, Indian states should implement a helmet law and commit to enforcing the law’s statutes. It was also seen that two-wheeler ownership was not limited to lower income populations, as is commonly believed. The monthly household income of 33% of two-wheeler users was between INR 25,000 – 50,000 (USD 332 – 830), with an equal third below and above this range. Two-wheeler ownership was actually seen to increase with higher household incomes. One third of two-wheelers users who had children also owned a car. Knowing that these users generally have a higher than expected level of income can influence policy in two ways. First, these users have the disposable income to pay fines for not wearing helmets, yet will likely still feel the pain of a fine. Proper pricing of fines can provide strong incentives for safer two-wheeler use. Additionally, many two-wheeler owners can afford to pay the full cost of use. This may include higher taxes and fuel prices, congestion and parking fees. However, EMBARQ India’s findings in Pune suggest that given the increased need for mobility and the currently unmatched benefits offered by two-wheelers, taxes and fees may not prove to be enough of a disincentive for people to stop using two-wheelers and shift to more sustainable transport modes. It seems that such ‘push’ strategies can only be effective when preceded by and combined with ‘pull’ strategies, such as improving multi-modal public transport systems, and making these services affordable and attractive. Drawing on lessons from Taipei and other cities in Asia, relevant two-wheeler management strategies that have helped improve road safety and traffic efficiency should be explored and implemented. These relate to road design, traffic engineering and management, two-wheeler specific traffic regulation measures, parking management, education and enforcement. With a combination of clear policy, innovative design, and stakeholder commitment, two-wheelers can replace cars in some circumstances, and in others can themselves be replaced by sustainable transport to help Indians move towards more sustainable mobility solutions. To learn more, access the full working paper “Motorized Two-Wheelers in Indian Cities – A Case Study of the City of Pune”.